MURDOCK TALK: Darrell Jabin, Oregon's traveling historian, will present "Building Oregon: How the State was Grown and Developed" from 7-8 p.m. at the Museum of the Oregon Territory, 211 Tumwater Drive, Oregon City. EDIBLE LANDSCAPING: Master Gardener Laura Huckaba will discuss edible landscaping at 6 p.m. at the Gladstone Library, 135 E. Dartmouth St.
PIONEER CENTER CLOSURE: Oregon City's Pioneer Center will be closed until March 31 for its annual building maintenance. 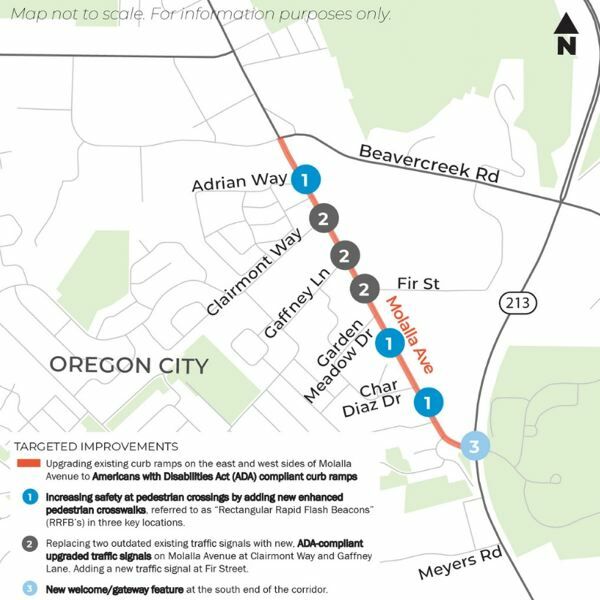 MOLALLA AVENUE: Learn more about a $7.8 million streetscape project on Molalla Avenue between Beavercreek Road and Highway 213 from 5-7 p.m. at the Oregon City Public Works Building, 13895 Fir St. In addition, find out about a project to build new sidewalks in 2020 at bit.ly/molallaave. COFFEE WITH A COUNCILOR: Meet with a Gladstone city councilor at 6:30 p.m. at the Gladstone Senior Center, 1050 Portland Ave.
WISE-WELLNESS INITIATIVE: Learn about the aging process and how to make healthy lifestyle choices during the six sessions offered by this program. It meets from 1-3 p.m. Wednesdays, through March 27, at the Milwaukie Center, 5440 S.E. Kellogg Creek Drive. Registration is required; call Linda Whitmore at 503-794-8037. HERITAGE TALK: Get the latest on the locks in the presentation "Status of Willamette Falls Locks – An Update" at 5:30 p.m. at the Oregon City Elks Lodge Ballroom, 610 McLoughlin Blvd. Speakers include Sandy Carter, Jeff Hicks and Russ Axelrod. Free.? DOCTOR WHO CLUB: This group will meet at 6 p.m. at the Gladstone Library. STORYWALK: Kids and families are welcome to a "Where the Wild Things Are" storywalk, sponsored by the Oregon City Library. It starts today and continues through March 31. Call the library at 503-657-8269 for more details. LITERARY TRIVIA: Enjoy an evening of literary trivia from 8-9 p.m. at the White Rabbit Books and Gifts shop, 503 Main St., Oregon City. HOME-SCHOOLERS ACTIVITY: Home-schoolers ages 5 and up are invited to a bookmaking workshop at 1:30 p.m. at the Ledding Library. QUILT SHOW: The 25th annual Airing of the Quilts takes place from 9 a.m.-4 p.m. today and Saturday at the Milwaukie Center, 5440 S.E. Kellogg Creek Drive. SENIOR EXCURSION: Join the Gladstone Senior Center's excursion to Stone Cliff Inn for lunch. Meet at 10:30 a.m. at the center, 1050 Portland Ave.. Transportation cost is $5, lunch is extra. Call 503-655-7701 to sign-up. BRAIN GAMES AND TRIVIA: This class will exercise your mental muscle. It takes place from 10:30-11:45 a.m. at the Milwaukie Center. There is a $1 drop-in fee. Also April 8 and 22. TEEN MOVIE: Youth in grades six to 12 are invited to enjoy the start of spring break by unwinding with popcorn and the movie "Miss Peregrine's Home for Peculiar Children" from 3-5:30 p.m. at the Oregon City Library, 606 John Adams St.
MINDFULNESS MEDITATION: These workshops, open to all, take place from 2-3:30 p.m. and 7-8:30 p.m. Tuesdays through April 23 at the Pioneer Center, 615 Fifth St., Oregon City. Cost is $88 for all sessions or $10 per session for drop-ins. To register, send check payable to: Surja Tjahaja, P.O. Box 631, West Linn, OR 97068. MASTER GARDENERS: Cindy Manselle will discuss raising chickens at 6 p.m. at the Gladstone Library. TECH HELP: Get technical help from 5-7 p.m. every fourth Wednesday at the Oregon City Library. WILD RUMPUS PARTY: Youth age 12 and younger are invited to this event from 1:30-2:30 p.m. at the Oregon City Library. RIVERCREST: 7 p.m. Thursday, March 21, First Presbyterian Church, 1321 Linn Ave., Oregon City. SOUTH END/HAZEL GROVE: 7 p.m. Thursday, March 21, United Methodist Church, 18955 South End Road, Oregon City. COMMUNITY THEATER: New Century Players presents "Beau Jest," a sweet romantic comedy. Performances take place at 7:30 p.m. tonight and March 23, 29 and 30 and at 2 p.m. March 24 and 31 at Rex Putnam Blackbox Theater, 4950 S.E. Roethe Road, Milwaukie. General admission tickets are $20, seniors are $15 and students are $10, available at the door and online at NewCenturyPlayers.org. For more information, call 503-367-2620. PLAY READING: Clackamas Repertory Theatre presents "Old Love New Love," by Laura Brienza, at 3 p.m. in the Osterman Theatre, on campus at Clackamas Community College, 19600 Molalla Ave., Oregon City. The $20 ticket includes coffee and cookies. The play explores the pain of Alzheimer's with humor, poignancy and compassion. SPRING BREAK PERFORMANCE: All ages are invited to join family performer Red Yarn and his lovable critters for a high-energy music and puppet show at 2 p.m. at Ardenwald Elementary School, 8950 S.E. 36th St., Milwaukie. Sponsored by the Friends of Ledding Library. MARCH FOR MEALS CAMPAIGN: All month, the Pioneer Center will participate in the national March for Meals Campaign. Volunteers are needed for the Meals on Wheels program and donations are always welcome. Call 503-657-8287 for more information.